I have neither so speedily nor so thoroughly annotated a script of Caryl Churchill’s than has proven to be the case with Love and Information (The Royal Court Theatre, 6th September to 13th October 2012). Trying to retain as much information as possible about the Royal Court premiere was a challenge. Described on the back cover of the published script as a ‘fast-moving kaleidoscope’ in which ‘more than a hundred characters [played by 16 performers] try to make sense of what they know’, it is hard to (re)capture the production details. There was both a clinical feel and sense of mathematical precision to the production’s visual aesthetic. A set that had the appearance of an all-white Rubik’s cube (designer Miriam Buether), remained constant throughout the scenic vignettes in which repeatedly changing characters, for the most part in duos, puzzled over the emotional fabric of what they know, how they know, the danger of knowing, the loss of knowing or false ways of knowing. While it was never a question of altering the cube, swift character and prop changes (each time minimally deployed to signify a particular locale – a sauna, living room, garden, gym, night club, office to name just a few) were handled by blackouts: think of a computer screen repeatedly flashing from empty (blank) to visual overload. If in performance these snap-shot scenes felt like a dizzying, information-fuelled, emotional roller coaster (moods repeatedly dipping and lifting), Churchill’s script reminds that this is achieved only by the precision she brings to her writing and dramatic structure. (An aside: a huge thanks to the Royal Court for continuing to offer heavily discounted scripts in lieu of over-priced, lavish but generally uninformative programmes – West End theatres please take note!) Her formal compression of ‘a number’ of scenes into a compositional whole is achieved by mapping out seven sections, each with seven sequences (with the seventh section encompassing an additional, final scene). Yet this regulated structure can also be deregulated: while the ordering of the sections may not change, Churchill instructs, scenes can be played in any order within a section (a further challenge to my copious note-taking as the Court variously deviated from the ordering of scenes as set out in the published text). Moreover, she offers a set of ‘random scenes’ (collected at the back of script) that she also directs can appear in any of the sections. These indeed have a ‘random’, playful quality, varying from the minimalist action ‘someone sneezes’ to the recitation of the seven times table (this one, not, as far as I recollect, used in the performance, though I cannot resist noting that Churchill’s instruction begins by counting ‘seven sevens are forty-nine’ – the very number of scenes in the play). While these are optional, one ‘random scene’ entitled ‘Depression’ is described as essential and takes the form of ‘random items’ (she has a list) spoken by one character to a depressed and silent other. Personally, the most memorable of these ‘Depression’ moments was for me the sound of rain heralding Linda Bassett and Sarah Woodward, seated on deckchairs, with faces barely visible beneath hooded waterproof jackets – probably because it brilliantly captured my own depressive feelings about this British ‘summer’. While the published script sets out Churchill’s titles for each of the scenes, these were not used in the production (no sign-posting, Brechtian or otherwise). Rather, in performance, each and every scene was announced by Christopher Shutt’s soundscape, allowing for associative connections to be made between the aural and the visual. So, for instance, sounds of seagulls precede two women in a remote, information-free location – no television, no mobile phone signal or internet connection. Another time, we listen to a broadcast commentary on a snooker match and are then thrown into a young man’s panic attack. The ‘smashing’ in his ‘skull’ of which he complains, resonates with the sound of cues and snooker balls bashed around the table, heard just moments before. Aurally we register barking before we see a village green complete with wicket and, I should add, the green is vertically set, not horizontal. 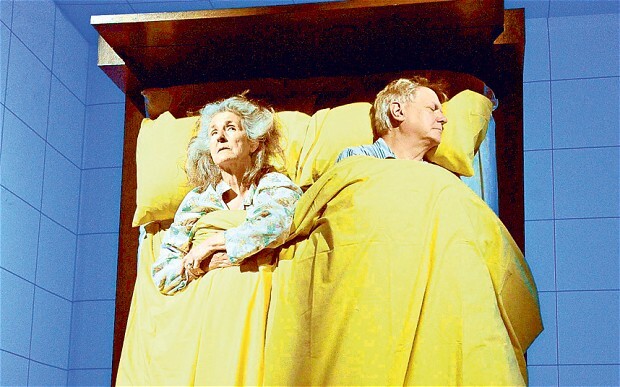 Ditto the delightfully funny, upended bed scene in which an elderly, sleepless woman (Susan Engel) abandons her slumbering partner to go on Facebook. Her ‘head’s too full of stuff’. It was a highly memorable moment (much laughter of recognition from the audience) that encapsulated the overall feel of the play: the human struggle to make sense of our contemporary lives in a state of restless information overload. A Rubik’s cube is a puzzle you can solve, with a lot of time and patience, or in a relatively short time if equipped with a crib sheet to notate the order in which layers might rotate and move to complete the game. However, in Churchill’s case, the dramatic puzzles she poses about our contemporary world are those to which there are no easy solutions. Watching the play, the question of how ‘love’ and ‘information’ connect, or conversely disconnect is a seductive puzzle. All the while characters process information, emotions underscore, inform, states of ‘knowing’: a father resents having to give information on a census form; a child struggles to understand pain; a man is passionate about red flowers; another is passionately defensive about his virtual girlfriend. What Churchill shows are contemporary ways of ‘knowing’ as intellectually and experientially driven. An inability to feel can produce dangerous states of not knowing, Churchill hints. For instance, in one scene a man crouches down beside a woman ballet dancer, apparently distraught and slumped beside the wall of the cube, and tells her the story about a child who did not know fear. Not knowing fear, the child gets eaten by a lion. There are hints that new social media and systems of communication may be hindering people’s capacity to be in touch with their feelings (something Churchill has long professed as essential to her ideal of a more democratically organized society). For instance, in the scene ‘Earthquake’ that in performance was played as a night club scene in which a man and a woman shout at each other, seemingly speaking over loud music (that we don’t hear), the woman fails to feel the damage produced by the earthquake, this despite the man’s attempts to verbalise what this might like, or feel like. Or, in the ‘Remote’ scene referred to earlier, Bassett, playing a character quietly content with her distance from all things technological, ends the scene by reminding her interlocutor that you don’t have to listen to a weather forecast, ‘You’ll find you can feel if it’s raining’. That said, Love and Information does not propose a straightforward critique of a technologically driven world, but rather reveals successive ‘acts’ of information as scenes in which emotions variously are shown to have the capacity to produce altered states of ‘knowing’, overall highlighting the impossible ‘messy’ task or puzzle of trying to make sense of what we know and who we are. Many of the elliptical, scenic fragments feel as though they contain a huge, emotional drama condensed into a matter of a few minutes. Cue the ‘Simpsons’ theme tune and a sister delivers a life-changing bit of information to her telly-watching brother: ‘Mum’s not your mother, I’m your mother’. In another sequence, a man (sitting on a toilet) refuses to recognize a woman who insists she is his wife and who loves him. He gives vent to how she disgusts and frightens him. Such moments feel like cryptic clues to larger back stories that we cannot know, but somehow feel we know in the moment of watching. Is how we feel about our relations to others one of the hardest questions to answer? Perhaps it might be, Churchill’s last scene suggests. As the entire cast assemble, seated in a surgery-styled waiting room, a young man poses quiz type questions to a young woman. Confidently replying to questions demanding obscure, highly specialist factual information (‘How many diamonds were mined in 1957?’ or ‘What sound does a capercaillie make?’), the young woman hesitates to answer the man’s emotionally loaded question, ‘Do you love me?’ Two questions later and in advance of answering a final third question, she declares her love amidst the ‘congregation’ gathered in the waiting room: ‘I do yes I do. Sea anemone.’ It was a moment that resonated a powerful contradictory pull between ‘love’ and ‘information’, with her romantic declaration piercing the high energy overload of seemingly ‘useless’ facts. In other words, it was the one question (and answer) that was meaningful for those of us watching. I have no hesitation in declaring that love is what I feel for Churchill’s theatre, for a body of work that is unsurpassed on today’s British stage in its capacity to innovate ways of (ac)knowledging the contemporary world and its critical sensing of the more democratic worlds that are to be hoped for and are yet to be loved. Arguably less explicit in her political critique than in other of her plays, such as Top Girls, Fen or Serious Money, it is, nonetheless, the very process of theatrical engagement, of how, through theatre, we feel our way towards understanding the world and of how this generates altered states of perception or ‘knowing’, that Churchill submits to playful interrogation in Love and Information. – Caryl Churchill | Drama Queens Review”? Carly Churchill is one of the most, if not the most innovative and political of dramatists writing for British theatre to-day. Therein speaks the motivation!